Group and private motorcycle rider training. CJRT specializes in helping riders increase their comfort level. Learn about our Basic Rider Course and Basic Rider Course 2, for more experienced riders. Whatever your skill level, we’ll get you on the road. Don’t wait! Classes fill up fast, especially in the summer. Check out our course options in Mercer and Atlantic Counties. The 2019 schedule will be posted soon. Prefer to ride solo? CJRT offers private lessons for those looking for a more customized, one-on-one training experience. Looking for a cool gift idea for the rider — or future rider — in your life? How about time with us! Learn about sharing the joys of a fun and safe experience. 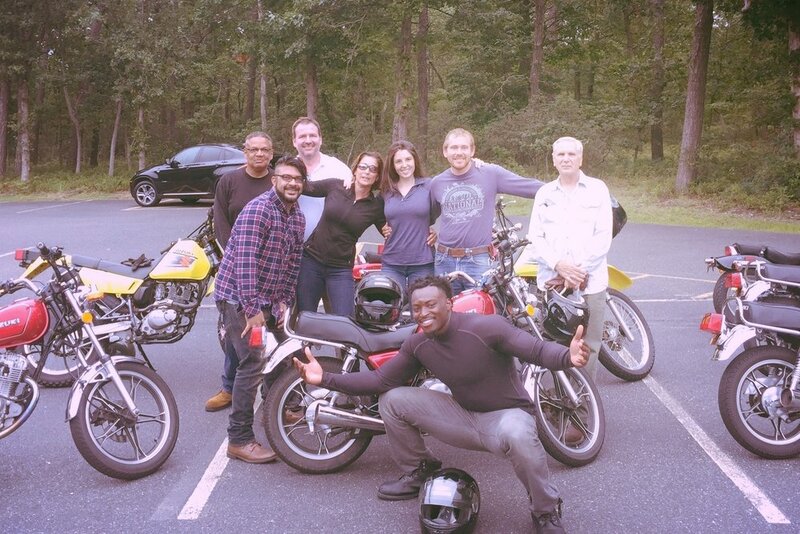 About Central Jersey Rider Training, Inc.
As the popularity of motorcycling continues to increase, there’s no better way to learn to ride or refresh your riding skills than from instructors using proven methods. Our instructors have many years of experience riding various types of motorcycles and in various types of terrain. Whether you are a novice rider, a scooter rider, a returning rider, or an experienced rider, Central Jersey Rider Training, Inc. has a class to fit your needs. We are approved by the Motorcycle Safety Foundation (MSF) and the New Jersey Motor Vehicle Commission to offer the New Jersey Motorcycle Safety Course to motorcycle and scooter riders. Our primary locations are Mercer County Community College and Atlantic Cape Community College. Register by phone by calling Gina at 1-877-308-CJRT (2578).